I am learning F# and implemented Conway's Game of Life as an exercise (There are also other implementations on CodeReview). I have tried to forget all my object-oriented background and practice "functional thinking". Any feedback is welcome, especially related to alternative (more functional) solutions. line |> Array.fold (fun agg i -> agg + (if i = 1 then "X" else ".")) ""
With only a couple of hours ahead of you in my experience with F#, I find the essence of your code fairly functional, although the graphic output is hard to grasp as it has a lot of flicker. Below find a gentle review of your code with improvements (or at least another way to do the things) and inline comments. 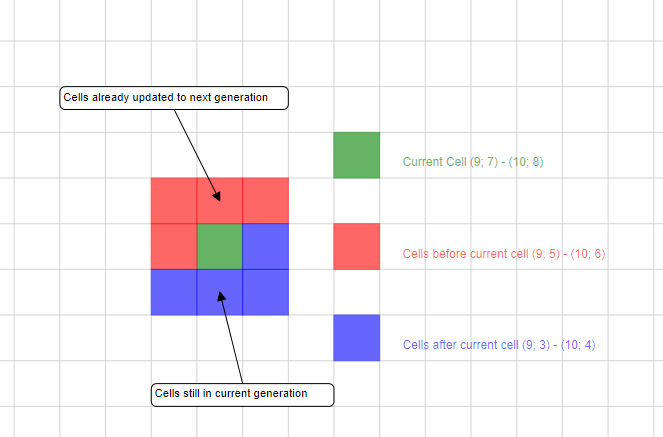 I've tried to improve the graphic output by using colors and a distinct update of the cells only when they change. your combine function is in fact List.zip, you might want to explore the Array and List sections of the standard library, they are full of very useful functions that will speed-up your development. you are using '0' and '1' to model your two states, why not booleans ? It would eliminate the need for some tests. are indeed functional but inefficient and, I believe, not as readable as using a loop. F# is especially powerful because it is a hybrid language (and not a purely functional one) : don't hesitate to leverage arrays and loops when it makes sense. Not the answer you're looking for? Browse other questions tagged beginner f# game-of-life or ask your own question.